Moment connection modules have been added to Osdag for the first time. Shear connection modules from the earlier version have also been revised. Many bugs and crashes have been fixed. Some new features have been added. The Windows installer has been revamped for easy installation. Osdag is now more efficient and much smoother. 2. Windows installer (both 32bit and 64bit) has been completely revamped. 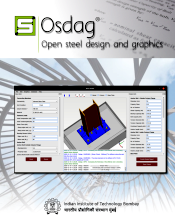 It is now very easy to install Osdag on Windows with a few simple clicks. 3. More design examples have been added. 4. Design preferences can now be imported along with the input values from the .osi file. 5. 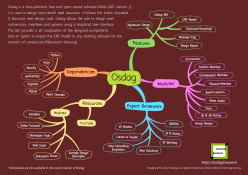 New links to the Video Tutorials and Osdag Forum have been added to Osdag top menu. a. Fixed the issue where providing the plate height before choosing the beam section was crashing Osdag. b. Fixed the issue where loading input from any file type other than the .osi file type was crashing Osdag. a. Maximum weld thickness check is added. b. Minimum and the maximum height of endplate checks are added. c. Maximum plate thickness check is added. d. Detailing, which was based on minimum pitch distance earlier is now based on minimum end distance. e. Some corrections/modifications are made in design calculations. f. 8.8 grade bolt has been added to the list of bearing bolts in the end plate connection. 3. There are some more known bugs and issues in Osdag which will be addressed in the future releases. Download the latest version now here.